Wow! This heart wrenching true story of David vs Goliath, is one of the best I’ve ever heard. In 1953, Jonesboro, Arkansas, a baby boy was born – dead. The attending physician set his little body aside and tended to his mother for 18 minutes. Now, more than 60 years later, that boy leads an internationally known ministry that encourages hundreds of thousands of people every year. 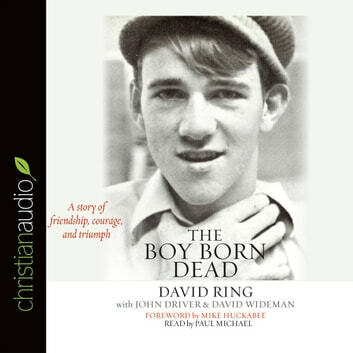 The Boy Born Dead tells his incredible story from the perspective of his best friend, David Wideman. What a heart wrenching, true story. I was shedding tears even in the first chapter! This is a story of an unlikely hero, with a courage that is nearly impossible to have for such a life, especially for this young man David, born with Cerebral palsy. This deep-telling story brings to reality the cruel nature of ‘normal’s’ with a plaything to laugh at. David was indeed a plaything for certain people (including an abused girl!). Although he, himself had developed a cast-iron harshness; an internal fortress that proved difficult to break down… he came to know God and this changed so many things about him and the world around him. This story is a fascinating account of his life, which right off the bat, should never have been. He was in fact declared ‘dead’ on his birth, for 20 minutes! But oh no, David rose against all obstacles and conquered. A real David, and Goliath story that will have you racking thorough the pages at break-neck speed. I bet even the toughest of us could not read this, without having those silly water spouts (our eyes) flowing freely. A must read!! N.B. I listened to the audiobook version of this story, which was narrated superbly, by Paul Michael. I challenge anyone to read this story, without shedding any tears. If you don’t shed tears, then unfortunately… your wood is wet! May your life never be the same again!